To have a holiday in the beach town of Monte Clerigo is a very special experience. The small houses in this beachside village have been inhabited by Portuguese families and fishermen for centuries. There are two wonderful restaurants and an outdoor cafe. Excellent fishing and swimming along a wide sand beach. 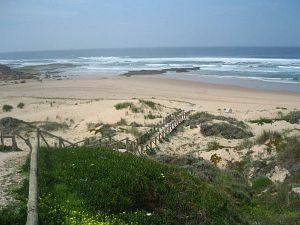 This apartment has a wonderful spot DIRECTLY in front of the beach in Monte Clerigo. The door from the house is 20 meters to the sand! One bedroom apartment with fully equipped kitchen, bathroom, living room with double sleeping couch and babybed, all rooms with windows facing the sea.